A friend of mine called Sarah has bought three not so little piglets. They’re only 9 weeks old but already quite porky. They’re also rather endearing and very friendly – snuffling and snorting around their wooded enclosure. One of the piglets has been nick-named ‘rotavator’ because he seems to be particularly good at turning over the soft earth with his nose. Even though these pigs are destined to become ham, bacon, sausage and pork chops, they appear to be living in a pig heaven. Plenty of shade, crumbly soil and regular supplies of food. They’re given pig nuts to fatten them up. But the remaining part of their diet is a little more controversial. I was horrified to discover that it is actually illegal for any food that has been through a domestic kitchen to be used for pig food. That includes potato peelings, carrot tops and apple cores. 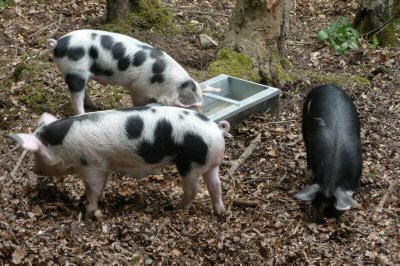 If you go to the supermarket and buy some fruit and vegetables you can give it directly to the pigs – but not if you’ve stopped off in the kitchen en route. This is yet another example of the over-the-top nonsensical legislation that has been brought in following BSE and foot and mouth. Laws are being passed that are more mad than the mad cows – or pigs – they are trying to prevent. They are being devised on the basis of what could be a problem and applied across the board, whether it makes sense or not. The result of this is that for the first two days in their new home these piglets were being fed whole bananas and fresh vegetables that were fit for human consumption. My friend then went to Waitrose to see if she could have some of their food waste. The request was refused even though it transpired that the waste from that store all went directly to landfill. The local Sainsbury store was better – they were sending food waste to a nearby wildlife sanctuary. More positively, I can report that Sarah has found a local organic retailer who is happy to provide a bucket of pig feed every week. The piglets will apparently be joining some other animal consumers in hoovering up the leftovers. On average, waste food has a carbon footprint that is 10 times greater than packaging. But whilst there’s uproar about the excessive packaging on food. In most developed countries we actually waste about half the food we produce hence the campaign Love Food Hate Waste. And increasingly councils are trying to collect food waste either for composting or for anaerobic digestion – to collect the methane gas from it and use it for fuel. But pigs are a traditional dustbin for food waste. It seems to me that it’s a crime to remove their integral role in the domestic food chain. My garden isn’t so suited to pig rearing as Sarah’s but if I ever manage to go that route, I’m pretty sure I’ll be flouting the law and giving my pigs all sorts of delicious peelings and scraps. B***** the bureaucrats. This entry was posted in About me, BLOG, Done, Farming & Agriculture, Government & Regulation, News 2009 and tagged Farming, Food, Government, Local, Pigs, Regulation. Shades of Tom Hodgkinson and his 'little piggie went to market' saga..